A lot has changed in the culinary world in the past 31 years. That’s how long Market Street Oyster Bar has been in business; it opened in 1982 in the historic New York Hotel, which itself dates back to 1906. When I think back to 1981, there were no celebrity chefs, Food Network or reality cooking shows—just a few people like Julia Child, Jacques Pepin, Jeff Smith and Graham Kerr cooking on public television, with the notion of educating viewers to cook at home. There may have been food trends—I remember fondue getting some traction at one point—but nothing like today’s food fads (pork belly and sliders come to mind, for example). And certainly, much has changed on the Salt Lake City culinary scene since 1981, when original Market Street Grill owners John Williams, Tom Guinney and Tom Seig decided to bring fresh seafood to landlocked Utah. I wasn’t in Utah at the time, but I doubt it was easy to find a fresh piece of fish in restaurants back then. Today, thanks in part to an arrangement Market Street’s owners struck up with Delta Air Lines years ago, fresh fish that was on a boat yesterday morning can be on your dinner plate tonight. Yet, despite all the changes through the years in how, what and where we eat, Market Street Oyster Bar has remained remarkably successful, steady and solid. The menus have evolved to include modern flavors like Hawaiian ahi tuna with ginger-soy sauce ($30.99) and tempura shrimp with a sweet Asian sauce ($15.99), but the Market Street menus’ mainstays are still mostly simple, fresh, unadulterated fish and seafood—which is why I believe the Oyster Bar, in particular, has enjoyed so much staying power. I don’t recall ever visiting the downtown Market Street Oyster Bar when the place wasn’t bustling. It has a lively ambiance, and whether you grab a table or cozy up to the bar, don’t be surprised if, before you finish your meal, you’ve struck up a conversation with perfect strangers. It’s got that kind of vibe. Each Market Street meal begins with a gratis loaf of crisp-crust sourdough bread with butter, which comes in individual foil packets. I’ve never quite understood why the folks at Market Street don’t serve butter in ramekins, but so be it. The bread is free and addicting. I always follow up a couple slices of sourdough with oysters on the half-shell. There’s a big board on a wall at the Oyster Bar listing the fresh oysters that are available, which usually includes Blue Points from the Chesapeake Bay, Kumamotos from California’s Humboldt Bay and—my favorite—Kusshi (Japanese for “precious”) oysters from Ship’s Point, British Columbia. For oyster newbies who might not be up for putting something large, raw and slimy in their mouths, Kusshis are a good “starter” oyster, since they’re small in size and have an ultra-clean flavor. At the oyster bar, I typically order a mix of the different oysters available, to sample a range of flavors. 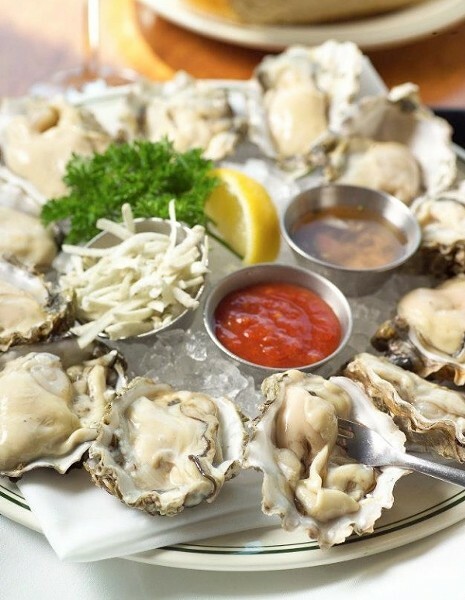 Oyster lovers should keep in mind that on Mondays, Market Street offers their oysters at half-price, all day, and half-price appetizers from 4 to 6 p.m. If raw oysters aren’t your thing, try going old-school with an order of classic Oysters Rockefeller ($14.99). One small quibble: I’ve never understood why a place called the Oyster Bar doesn’t offer Chablis, the classic wine pairing for oysters. Oh, well, a bottle of Pierre Sparr One Alsatian wine did the trick. For lunch, especially, I like the seafood Louis salad offerings ($17.50-$29.99). They are mixed green salads with hard-cooked egg, asparagus, tomato, red bell pepper, avocado, olives, beets, capers and watercress, topped with a choice of chilled shellfish: jumbo Gulf shrimp, Oregon Bay shrimp (tiny, but tasty), Northwest Dungeness crab, Alaskan Snow crab or a combination of Bay shrimp and snow crab. There’s also a very good classic Caesar salad ($9.99) to which you can add blackened or broiled chicken ($4.99) or Atlantic salmon ($7.99). Fresh, wild Alaskan halibut is one of the best things to order at Market Street, especially during their Wild Alaska Halibut Festival, which begins in early spring. But the halibut is good any time of year, and Alaskan halibut is a sustainable fish, so you can enjoy it with a clear conscience. My wife’s dish of Alaskan halibut with shrimp and Béarnaise sauce ($30.90) was excellent, and came with a choice of clam chowder or salad, and either potatoes, fries or rice. The mashed potatoes (a new addition to the sides at Market Street) were excellent, and I slurped up most of my wife’s rich, piping-hot clam chowder and used some of that sourdough to scoop up every drop. I have to say that for the price—$23.99—the fried fisherman’s platter was a disappointment. It was a fairly puny portion of battered and fried jumbo Gulf shrimp, sea scallops (a couple), calamari and a stingy piece of New England cod. I just don’t think fried food is what Market Street does best. That’s why I normally opt for their chilled seafood, which I always find satisfying. On my latest visit, I enjoyed a chilled seafood platter of a half-pound of shrimp and a half-pound of Alaskan snow crab ($29.90). Before serving, the crab is pre-cracked in strategic places, making it much easier and less messy to eat than it would be otherwise. I like my chilled shellfish simply adorned with nothing more than drawn butter, which our excellent server was happy to supply. Now in its fourth decade, Market Street is going strong and still the go-to choice for seafood in Salt Lake City.